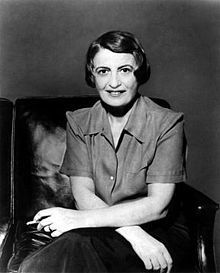 Over the past year I’ve developed a genuine fascination with Ayn Rand and the people who relentlessly champion her objectivist philosophy. It all started during the 2012 U.S. presidential election when VP candidate Paul Ryan stated that he was an avowed fan of the iconic author. This was the tipping point that finally got me to plow through “Atlas Shrugged”. For years I’d been hearing conservative pundits rave about it and, since I love good sci-fi with a dystopian theme, I assumed it would be well-written and interesting. It is neither. Listening to the book on tape was a mind-numbing experience, not unlike getting cornered at a party by your staunch Republican relative who has had way too much to drink and has way to much to say about “them libberalss who are ruinin’ everything!” I was amazed at how dumb the plot is, how ridiculously one-dimensional the characters are and how insanely long-winded the author can be. Ayn Rand has absolutely no sense for editing and her rambling diatribes are proof that you should never give typewriters to Benzedrine addicts (she had a decades-long dependency on amphetamines). Now if you don’t have the time to read the book (the unabridged audiobook clocks in at 59 hours), be sure and check out the first two installments of the “Atlas Shrugged” movies. They are wonderfully bad and I found them to be marvelously comical in their own unintentional way. For some reason, the producers of the films couldn’t come up with much of a budget to make them so they are really cheap and poorly written. The actors must have been given instructions like, “Act as wooden as possible while delivering this hackneyed dialog”. But these movies stick to the original plot like glue, and I guess that is why Part 1 and Part 2 have received rave reviews among conservative movie critics. Here in Colorado, talk show host and Denver Post editorial columnist Mike Rosen has gushed about them repeatedly on his radio show and in his editorial column. After I plowed through the two “Atlas Shrugged” movies back to back on consecutive nights on Netflix streaming, I watched the documentary “Ayn Rand & The Prophecy of Atlas Shrugged”. This film tries to make the argument that the Obama administration is similar the cartoon bad guys in Rand’s magnum opus. Seriously?!!! We live in a world where successful industrialists are flourishing and succeeding like no other time in history. It’s anything but desperate times for men like Bill Gates and Warren Buffett. 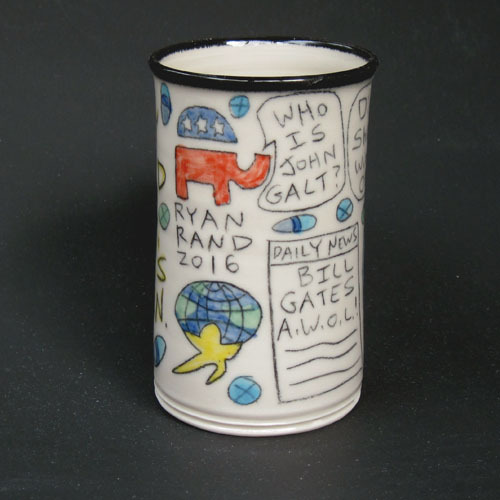 Do you think our current government business restrictions could ever push them to “go Galt”? 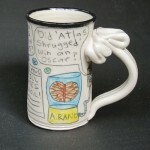 So my latest mug is the culmination of the hours and hours of research I’ve done on this topic. And it’s the latest installment of my “Paranormal Testimonial Mug Series”. Others in this group include, “My cat is a psycho killer” and “I am carrying Big Foot’s love child”. 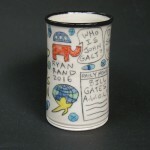 While it took Ayn Rand decades of work and 1088 pages of text to tell her story, mine was envisioned in just one afternoon and it fits on the outside of a ten ounce wheel-thrown porcelain coffee mug. 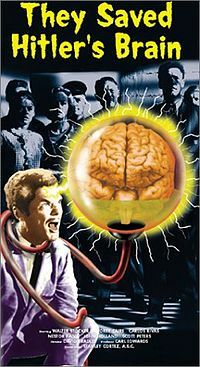 The plot is riveting: Ayn Rand’s brain is kept alive for decades and when modern computer technology is developed to communicate with her, the first thing she asks about is how well the film adaptation of “Atlas” did at the box office and at the Academy Awards. 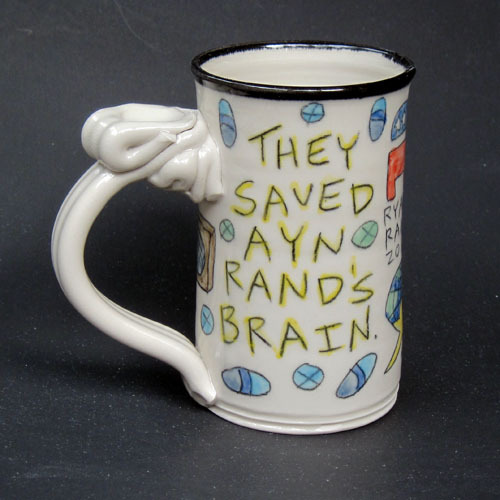 Then a joyously tearful Paul Ryan asks Rand’s amphetamine-fueled brain to be his running mate in 2016. A love scene ensues. Meanwhile, Obamacare sinks the economy and Justin Bieber, the Koch brothers and Paula Dean mysteriously disappear and escape to Sarah Palin’s secret hideaway in Arizona. That’s my pitch, Hollywood. I think we can do it for under 50 million if we can get the right cast. Have your people call my people. This entry was posted in New items and tagged atlas shrugged humor, atlas shrugged mug, ayn rand, ayn rand mug, john galt humor, mike rosen atlas shrugged, who is john galt? mug. Bookmark the permalink.